Report of Brig. Gen. J. E. B. Stuart, C. S. Army, commanding Cavalry Brigade, with congratulatory orders. GENERAL: In compliance with your written instructions I undertook an expedition to the vicinity of the enemy's lines on the Pamunkey with about 1,200 cavalry and a section of the Stuart Horse Artillery . The cavalry was composed of portions of the First, Fourth, and Ninth Virginia Cavalry. The second named, having no field officer present, was, for the time being, divided between the first and last mentioned, commanded, respectively, by Col. Fitz. Lee and Col. W. H. Fitzhugh Lee; also two squadrons of the Jeff. Davis Legion, commanded by Lieut. Col. W. T. Martin, the section of artillery being commanded by First Lieut. James Breathed. Although the expedition was prosecuted farther than was contemplated in your instructions I feel assured that the considerations which actuated me will convince you that I did not depart from their spirit, and that the boldness developed in the subsequent direction of the march was the quintessence of prudence. To begin the tour, we go to the intersection of Brook Road (U.S. Route 1) and Azalea Avenue north of the city. It was here that J.E.B. Stuart began his famous ride. Riding north on Brook Road for approximately .7 miles we come to a stop light providing access to a shopping center on the left and some fairly well preserved Richmond outer defenses earthworks. For reference, on the right side of the road, at the light, there is a pull over area that has three Virginia markers addressing the Richmond outer defenses. To visit the earthworks, turn left at the light and park in the shopping center parking lot. Starting Point for Stuart's Ride. 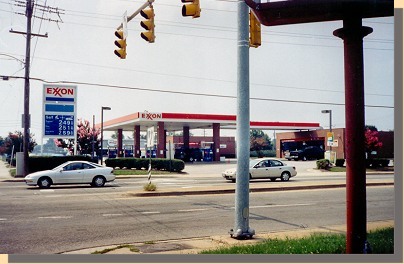 The southwest corner of the intersection of Azlea and Brook roads in Richmond, Virginia. This was the site of the Mordecai Farm, where Stuart started his trip. ( All photographs in this section, other than 19th century photographs, were taken in 2005 ). 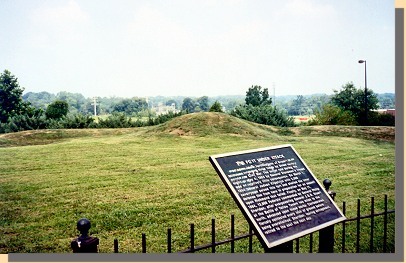 Riding north on Telegraph Road (Currently named Brook Road, U.S. Route 1) Stuart crossed Richmond's outer defenses near the site of these preserved earthworks . 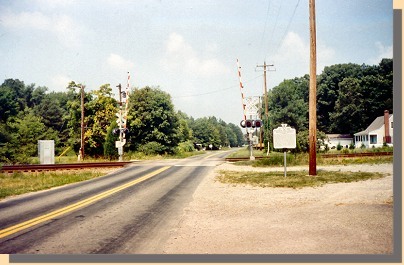 center, to Kilby's Station, upper left. Following Stuart, we continue north on Brook Road (U.S. 1) for approximately two miles, then turn left onto Mountain Road, Route 625. Approximately 1 mile down this road, we come to a fork at which Route 625 goes to the left. We do not follow Route 625, rather we continue straight onto Greenwood Road. About three miles down Greenwood Road, we turn right onto Old Washington Highway, Route 626; then, one and one-half miles later, we turn left onto Route 623. Finally, about a quarter mile down this road, we turn right returning to Route 626. A half mile down Route 626 we arrive at Kilby's Station. Kilby's Station, now called Elmont. State Road Sign at Kilby's Station. 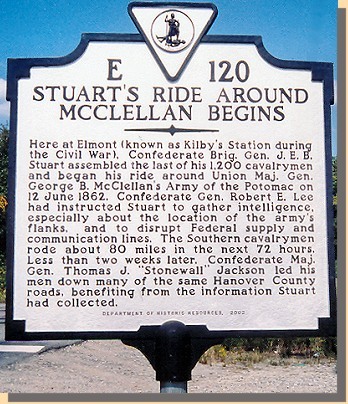 At the time of Stuart's ride, Kilby's Station was being picketed by some Virginia cavalry. Stuart picked up additional men here to accompany him on his ride.